My sister sent me some directions on how to make a tutu. It was so quick and easy (THANKS BECKY). 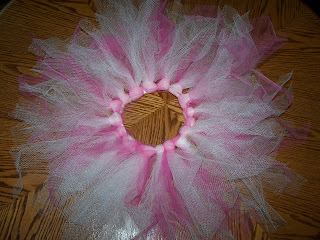 I now feel silly because the tutus I made my DD in the past I made a lot more complicated. It took me days to make them. I was able to make this in just a few minutes. This is the link I used to make them (scroll down) for the free online instructions. I wasn't happy with it at first because I thought the simple way to make this would make it look bad. I have to admit that once it was done and DD had it on. Unless you are looking very close at a bouncing dancing child you will not notice the difference. I did notice a HUGE time difference in making this. This was so quick and easy to make! I think I will stick with this method for now.